much in defense of the commissions' chilling crusades. that "freedom of speech and thought should reign." after the fact, in the form of hearings (rather than censoring first). HRCs. Except . . .
consultation with Internet Service Providers. Sadly the CCF, chose not to get a speaker who actually knew something about the CHRC and what they have been up to. Instead they dug up and wheeled in the ancient Alan BORINGvoy to address the audience. 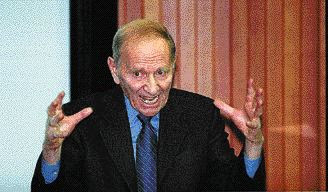 Some spectators commented that his speech resembled a bad rerun of Frankenstein, while BORINGvoy constantly raises his arms in a scary Frankenstein pose. PS: Borovoy has claimed for a long time that he never had any idea that the CHRC would censor speech. If that statement was true, he had to have been either blind or an idiot. Section 13 (Internet censorship provision) was included in the very first draft…. I guess now that so many have come out against Section 13, now it’s “I never had a clue it would be used to censor speech” …. Sure … sure. And where is Borovoy now to aid in removed Section 13? NO WHERE. He prefers to honk his own horn and talk about how bad Section 13 is. YET, the CCLA just sits back collecting money from gullible dupes who think their $20 a month actually goes to support free speech. BORINGvoy has not done a thing to support the Constitutional Challenge against Section 13. Bloody hypocrites…. I attended the second annual conference of the Canadian Constitution Foundation. It was called Individual Freedom and the Common Good :Defining Human Rights in a Free Society. It took place in Toronto. It was a wonderful three days discussing freedom. The three keynote speakers were excellent. David Frum gave an analysis of the Canadian Constitution. Eugene Meyer of the Federalist society, talked about that great organization has changed the debate in American legal circles. Professor Randy Burnett talked about how the US and Canadian Supremes confer rights. Elizabeth Brubaker defended property rights in defense if the environment. One of her statist opponents Albert Koehl of EcoJustice told of his organization's ( and others) lawsuit against HM Government vis a vis the Kyoto bill passed by the opposition. It was recently dismissed. During the aborignal rights panel, I asked if the reserves could be split up and the land be given title to the individual members. I don't think the panel understood. THe two of the other very interesting panels were the debate on the hrcs and judicial activism. I even got to tell a lawyer for the Federal hrc that section 13a should be abolished and Alan Borovy said that as well! The judicial activism panel was very interesting. The nature of that activism and whether there is activism was explored. Indeed one of the panelists, said the left felt there was right wing judicial activism in the past. The papers and vidoes will be posted in the weeks to come and I will post them. It was also a chance to see old friends like Gerry Nicholls and make new ones like Mark and Connie Fournier of Free Dominion. Here is a clip of Alan Borovoy. VIDEO: Here is some of the reply from Philippe Dufresne of the federal Human Rights commission. The Canadian Human Rights Commission (CHRC) kept its head down during the recent federal election. With no less than four ongoing investigations into its conduct, it wisely stayed beneath the radar. But with the election over, it's back at it, with its most egregious violation of our civil rights yet. In Saskatchewan, the CHRC is prosecuting a former Member of Parliament for politically incorrect mail that he sent to constituents five years ago. Jim Pankiw, an MP who served from 1997 to 2004, is on trial for sending out flyers criticizing Indian crime in Saskatchewan. If convicted, Pankiw can face massive fines. He could also face other orders, ranging from a forced apology to a lifetime ban on commenting about aboriginal issues. If Pankiw refuses to comply with such an order, he could serve time in jail. Aboriginal crime was a big issue for Pankiw's constituents. According to Statistics Canada, aboriginals make up only 9% of Saskatchewan's population, but they are 52% of the province's criminally accused. Pankiw wanted to get tough on crime; he wanted to abandon aboriginal "sentencing circles," and end racial quotas. His tone was aggressive, but talking tough about crime isn't supposed to be a crime in itself. Whether or not his was the best solution was up to his constituents. That's how a democracy works. But for CHRC lawyers and bureaucrats to weigh and measure Pankiw's political views is an outrageous incursion into the political affairs of Parliament. the complaint was filed more than four years ago, Smith found proof of Pankiw's racism in the colour of ink used in the brochures: black and red, on white paper. Those are "colours very much associated with aboriginal people, for whom four colours have come to be associate with the four cardinal directions and have great spiritual significance," wrote Smith. "One can hardly claim that the symbolism in this pamphlet is not inflammatory." A real judge would laugh that out of court. A real prosecutor would be too embarrassed to run with it. For Maclean's magazine and author Mark Steyn, last week's not-guilty finding by the B.C. Human Rights Tribunal is no doubt a welcome respite from writing cheques to their legal defence team. However, it is hardly a victory for free speech, or press freedom. All that happened was a government agency, after much deliberation, found their work acceptable. That is the role of a censor, and Canada has one for each province, territory and Ottawa. All are endowed by their legislatures with the right to examine what appears in print, to see whether it is "likely" to "expose" various people and groups to "hatred or contempt." Steyn's case arose from complaints by Muslim advocates to commissions in Ontario, B.C. and the Canadian Human Rights Commission itself, about an extract from his book America Alone, reprinted in Maclean's. In it, Steyn speculated what large-scale Muslim settlement in Europe might mean for law and society there. The Canadian Islamic Congress complained the article was likely to expose Muslims to hatred or contempt. In the end, the B.C. Human Rights Tribunal disagreed. However, it also pontificated that Steyn's piece contained historical, religious and factual inaccuracies, relied on common Muslim stereotypes and tried to "rally public opinion by exaggeration and causing the reader to fear Muslims." So there. An arm of government has judged a publisher, slandered its professionalism, questioned its motives, but concluded it was not quite so bad Canadians shouldn't read it. For the record, it was not Mark Steyn who caused readers to fear Muslims. It was Muslims who tried twice to blow up the World Trade Center, the second time with horrifying success. However, leaving aside the tribunal's own historical and factual inaccuracies, Canadians wishing to employ their free-speech rights will find no relief in the acquittal of Steyn and Maclean's by their three oppressors, unless they are as well funded and have similar prestige. The files are full of convictions of people who, lacking both, were chewed up by these commissions as warnings to other free-speaking Canadians. In supposedly free societies, government has no business having an opinion on whether a book is true, false or has merit. If it is hateful, there is the Canadian Criminal Code. Otherwise, Canadians do not, and should not, need government approval of their words. This acquittal changes nothing: The chill remains, and the fight for reform goes on. EZRA LEVANT: Silly kangaroo! Don't you know the rules? Convict first, then censor! Great post today by Ezra Levant. I laughed out loud a few times. Silly kangaroo! Don't you know the rules? Convict first, then censor! I received this letter today from the Canadian Human Rights Commission, couriered to my lawyer. It comes two months after the CHRC received my response to Rob Wells' human rights complaint against me (the third complaint against me this year). Dagenais waited until the federal election was over before contacting me -- I bet that was a direct order from Jennifer Lynch, the chief commissioner of the CHRC, who's already a big enough embarrassment to the government, and didn't want to pop her head up during an election. In her letter to me today, Dagenais says she's finally going to pass my defence along to the commissioners who will rule on whether I've commited a hate crime by republishing an Op-Ed by an Alberta pastor named Rev. Stephen Boissoin. You'll recall, Rev. Boissoin has been fined, given a lifetime ban on expressing his faith, and ordered to publicly renounce his faith, for daring to express a politically incorrect religious view. If the commissioners find me guilty, they'll prosecute me before the Canadian Human Rights Tribunal. In the thirty years they've been prosecuting section 13 "hate speech" cases, they've never lost. Political prosecutors in Iran and China would be impressed. But here's where Dagenais becomes a symbol of everything that's wrong with the CHRC and its censorship fetish: she blacked out portions of my defence before passing it on to the commissioners. Seriously -- she censored what I wrote in my own defence, before she passed it along to the people who will sit in judgment of me. She's only allowing me to say thing in my defence that she approves in advance. Look at the version of my letter she's passing on: several of my arguments are blacked out. You can read the full, uncensored version here (.pdf version here). It’s pretty embarrassing that you’ve taken two months to merely pass on my last letter to your superiors at the Canadian “Human Rights” Commission. I suppose all Canadians should be grateful for the CHRC’s sloth. Who knows how many journalists could be harassed if CHRC employees stopped playing solitaire and took to their work with real gusto? I’ll be charitable: perhaps everyone over there has simply been busy with the RCMP’s criminal investigation into the CHRC’s abusive and corrupt conduct, so your “real work” – censoring journalists, Christian clergy and political activists – has fallen by the wayside. I note that you have blacked out a number of my arguments before passing on my response to the commissioners. Silly kangaroo, don’t you know the rules? You’re not supposed to censor me until after the show trial. Remember: convict first, then censor! I know you’re excited about using your big, black censor’s pen but just wait – you’ll get your turn. You always do. I’m going to take the liberty of sending my unredacted remarks directly to your commissioners. I’m frankly not interested in your opinions about what is or is not “relevant” to my defence. Every drop of corruption, abuse and illegal conduct at the CHRC is relevant, and I’ll not have some junior bureaucrat telling me otherwise. I’m entitled to have my submissions presented in full to the censors that will decide my fate. Even the medieval Star Chamber permitted that. I’m sending this letter, along with my original response, directly to the kangaroos. So far, this nuisance suit hasn't cost me too much money, but I did have one of my lawyers, Tom Ross, review the letter to tone down the more excitable parts of it. I spoke with Tom today, and we're also continuing to fight the Alberta human rights commission's refusal to release their internal e-mails about me, as they're required to do by provincial freedom of information laws. If they're willing to go to court to prevent me from reading what they wrote about me, you can bet it's politically scandalous. I'd like to learn more about their abominable decision to spend $500,000 of taxpayers money, deploying 15 government employees to investigate me for 900 days. Wouldn't you? Tom says I still owe him a few thousand dollars; if you want to chip in I'd be grateful. Unfortunately, the lawsuits haven't stopped -- I'll tell you about a new one tomorrow. NATIONAL POST: Maclean's wins 'hate speech' human rights challenge in B.C. VANCOUVER SUN: Maclean's wins 'hate speech' challenge in B.C. The panel has concluded that the complaints are not justified because the complainants have not established that the Article is likely to expose them to hatred or contempt on the basis of their religion. Therefore, pursuant to s. 37(1) the complaints are dismissed. For the full monster PDF ruling, click here. Further reports from Reuters, the CBC, The National Post, The Vancouver Sun, CTV and LifeSiteNews, plus comment from Andrew Coyne, Mark Hemingway, Michelle Malkin, The Weekly Standard, the Canadian Arab Federation, the Canadian Islamic Congress, Hot Air, Jay Currie, Stage Left, Rob Breakenridge, Deborah Gyapong, The Western Standard, the Hyacinth Girl, Scaramouche, Eowyn, the Girl in Blue, and Kathy Shaidle & Pete Vere, with more at Free Mark Steyn! The British Columbia Human Rights Tribunal ruled today that a controversial article about Islam in Maclean's magazine did not violate the province's hate speech law. In acquitting the magazine, the Tribunal ruled that the article, an excerpt from Mark Steyn's book America Alone in which he describes the demographic and ideological dangers posed by a growing Muslim population in the West, was not likely to expose Muslims to hatred or contempt. The Canadian Islamic Congress, which brought the complaint, has previously failed in two other jurisdictions: Ontario, which said it did not have jurisdiction over printed material, and federally, where the complaint was rejected as without merit. CHRONICLE HERALD: Human rights: Pick a ruling, any ruling? Human rights: Pick a ruling, any ruling? WAS Mark Steyn’s October 2006 article in Maclean’s magazine, entitled "The Future Belongs to Islam," hateful towards Muslims? Three different Canadian human rights commissions give three different answers: No; technically no, but basically yes; and maybe. If you find that less than reassuring, you’re not alone. Last year, the Canadian Islamic Congress backed three essentially identical complaints before the Canadian Human Rights Commission and its counterparts in Ontario and B.C., complaining the Maclean’s published excerpt from the syndicated columnist’s best-selling book America Alone had exposed Muslims to hatred and contempt. What did Steyn write? In a nutshell, he argued the spiralling costs of the modern social democratic state, Western "civilizational exhaustion" and the tale of two birth rates – that of Muslim populations, particularly in Europe, rising and that of the "native" stock, people established in many Western nations for generations, falling – were leading to a West which more and more would embrace Islamic societal institutions like sharia law. As I’ve said before, think what you will of Steyn’s argument. That’s not the point. The question is: Does Steyn have a right to write his opinion? And does Maclean’s have the right to print it? In a country that enshrines freedom of expression and freedom of the press in its Constitution, you’d hope so. But given the creeping censorship in decisions of government-appointed human rights bodies in recent years, and the eagerness of "offended" groups to use these agencies to silence those they disagree with, the answers have been less than clear. So what happened with the complaints against Maclean’s and Steyn? In April, the Ontario Human Rights Commission reluctantly dismissed the complaint on a technicality. Under Ontario’s Human Rights Code, the provincial human rights czar lacked jurisdiction over what Maclean’s printed. That didn’t stop it, however, from essentially declaring Maclean’s guilty anyway. An excerpt from its announcement: "This type of media coverage has been identified as contributing to Islamophobia and promoting societal intolerance towards Muslim, Arab and South Asian Canadians." Amazingly, the Ontario commission was able – without benefit of hearings, where presumably Maclean’s could defend itself – to find Steyn’s article "promotes prejudice towards Muslims." In June, the B.C. Human Rights Tribunal – operating under broader legislative powers – convened to hear the same complaint, having declined to dismiss it earlier. For a week, Maclean’s lawyers found themselves attempting to defend the magazine against a bizarre array of poorly founded accusations, discussions of bad "impressions" and hurt "feelings" and other forms of subjective "evidence." Journalist Andrew Coyne live-blogged the hearings for Maclean’s for the week. To get a sense of how unbelievable the proceedings actually were, check out the circus at blog.macleans.ca/tag/hrt-live/. No decision yet from the B.C. human rights poobahs. Later in June, the Canadian Human Rights Commission announced it was dismissing its identical complaint against Maclean’s by the Canadian Islamic Congress. The reason? Based on the Supreme Court of Canada’s test for hateful speech, as defined in the 1990 Taylor decision, the commission found Steyn’s article was not "of an extreme nature." That means no hearings at all. Forgive me if I sound facetious. Three government-appointed human rights bodies presented with the same complaint. Three different reactions. Not exactly reassuring for those who argue complainants have been using these commissions, with their sometimes enthusiastic co-operation, to squelch free speech and force others to question whether exercising their freedom of expression is worth the hassle – and potential expense – of getting caught up in the gears of the Canadian humans rights bureaucratic machine.